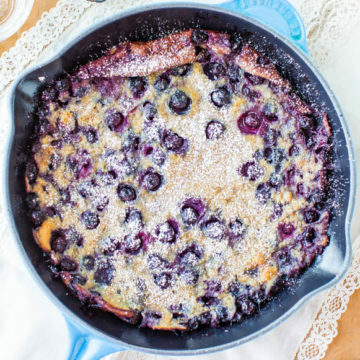 Successfully saved Blueberry Dutch Baby Pancake to your Calendar. You can also save the ingredients to your Grocery List. This oven-baked pancake has the chewiness of crepes with the thickness of clafoutis, and making it is as easy as making pancake batter. Because it’s baked, there’s no need to stand around flipping pancakes. The blueberries are juicy and abundant, but can be omitted or replaced with other fruit you have on hand. It’s amazing how much puff and bang for the buck you get with only 2 eggs and a small amount of flour in this easy, flavorful, puffy pancake.